UNITED STATES: An impact study at the 30MW Block Island project to gather real-time data for use at future projects is being undertaken by the Bureau of Ocean Energy Management. Visual, sound and environmental implications of an offshore project during construction will be examined during the real-time opportunity for development environmental observations (Rodeo) study. Data gathering will take place at Deepwater Wind's 30MW Block Island project off the coast of Rhode Island state. The site is the first US offshore project to begin construction,so until now there is no US experience from which to draw information, said a spokesperson for US government agency BOEM. BOEM said it currently relies upon conservative best-guess scenarios to lessen the environmental impact. "The offshore wind energy industry will benefit by having appropriate mitigation measures based on real data to ensure the marine environment is protected in a cost-effective manner," the spokesperson said. BOEM began the study during installation of the Block Island foundations, which started in July. The second stage will examine the scour protection and related monitoring equipment for one year. 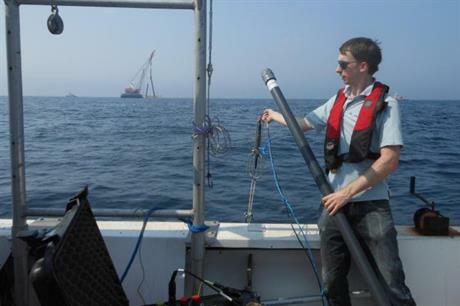 A third task will monitor noise levels above and below sea level during piling.